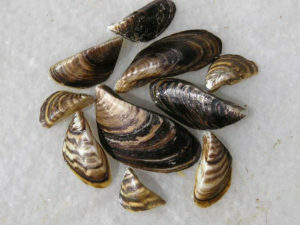 The Iowa DNR has confirmed that there are invasive zebra mussels in Lost Island Lake near Ruthven in Palo Alto County. The DNR’s Kim Bogenschutz says they periodically take water samples at lakes looking for young zebra mussels called veligers. She says they didn’t find any in the July sample, but found some in the August sample and then went to look for juvenile mussels attached to rocks and found some. Bogenschutz says the number of juveniles is small — but they have to face the fact that they are now there. She says the number of juvenile mussels attached to rocks along with the veligers is enough to confirm that they have an establish population in the lake. “And unfortunately, we expect the numbers to increase. She says there is no way now to get the zebra mussels out of the lake and they have to take steps to try and manage the population. Bogenschutz says there is work underway to come up with a way to control them. “I don’t think we’ll ever get rid of them completely, but we’ll have some ways that we’ll at least be able to lower the populations in some areas,” she explains. Bogenschutz says they had worried that the zebra mussels might spread from nearby lakes. Zebra Mussels were first discovered on the Mississippi river and later a small population was found in Clear Lake. She says the biggest way to prevent their spread is to follow the law and clean off your boat when you pull it out of the water. Bogenschutz says the low number of lakes infected right now is good news. Bogenschutz says you need to clean, drain and dry your boat. Clean any plants, animals or mud from boat and equipment before you leave a water body. Drain water from all equipment (motor, live well, bilge, transom well, bait bucket) before you leave a water body. And finally, dry anything that comes into contact with water (boats, trailers, equipment, boots, clothing, dogs), before you move to another waterbody. Find out more about preventing the spread of invasive species on the DNR website.